How far cleats should go in? Post subject: How far cleats should go in? I'm installing 3/4 Maple, 3.25 width and using a flooring nailer with cleats. The heads of the cleats aren't going flush with the wood or below, they stick up 1/32". I tried everything I could with the nailer I have, no way to get them flush or below. Should I be looking at buying a new nailer? Mine is a blue CH model, maybe it's just not strong enough for maple. The 1/32" doesn't cause a problem with the next board at all, but I'm thinking it may not be holding as good as it should? Is this typical or is it advised that the nail should be flush or below the wood surface a little? I used a finish 15G nailer and those I can drive by hand below the surface with no problem, but the cleats are another thing altogether. No way to get them to go any lower by hand. In some spots there were tiny cracks around the cleat along the tongue, 1/2inch or so.. so I'm also concerned if I do find a way to get them lower if it will split more. Maybe some floors actually need the nail to be not completely flush so it doesn't split? Post subject: Re: How far cleats should go in? Is this a pneumatic nailer? If so, can you increase the air pressure a bit and do some test shots to get the cleats set flush? If the slightly raised cleats aren't stopping the next row's tongues from sliding over the tongues and creating a tight joint then you should be ok. A 2" cleat will go through the tongue and 3/4" subfloor and will stick out the underside of the subfloor. If a joist is beneath a cleat the amount of penetration into the joist is negligible anyway so 1/32" either way is nothing to worry about . Tongue splits are not uncommon.....you can add a cleat nearby but not too close to the split. Don't nail too close to the end of a board. I got a new pneumatic nailer and it has more power, it was able to drive the cleats flush and below.. But now I ended up splitting a board at the end. And it's difficult because some pieces drive flush while some drive below flush and split, the quality of the wood is not equal. I was about 2 inches from the end when it split. I tried to go closer to avoid squeaks.. It says 2-3" in the instructions. The next board still goes in ok, but this board isn't held down very well at the end because it split. What do I do now? Just leave it? Try to take it out somehow? I think I should've just kept using the less powerful nailer. 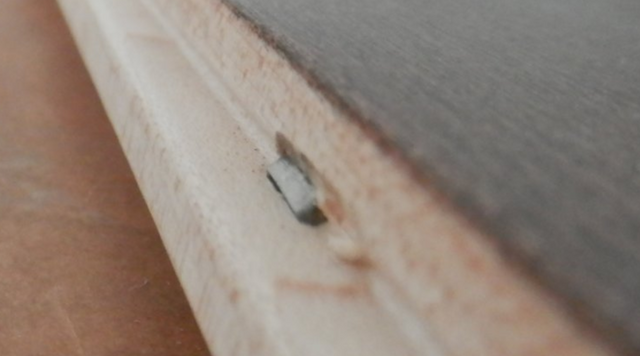 Predrill, at an angle, the tongue or groove at the end of the board and hand drive a 6D nail. Use a nail set. If you feel the board is a mess you can always remove it. An oscillating multi tool with a nail cutting blade will work to cut the cleats so that the board can be removed. You can also face nail. Predrill using a 6D nail, with its head cut off, in the drill. The hand drive a 6D nail. Trim head screws work well too. Better to underdrive and use a nail set than to overdrive and split the tongues. Do I cut with oscillating tool from underneath? I think that's the only way.. Maybe pry the board up first a little? I tried to use a nail set for the cleats that were 1/32 up, but no way, they won't budge. I agree it's better to underdrive, but I was afraid if the cleats are not flush they won't hold that well. Maybe I'm overthinking it. It was very close to cracking even at that point, now with the cleats flush, I have a big risk of cracking, I am getting half inch long cracks here and there going this deep. So I guess the depth of nails really depends on how easily the wood cracks, and not so much that it has to be flush or a little lower than flush to be in 'good'? Multitool blade slides in between the bottom of the floor board and the subfloor. The bottom of the cleat head is making contact with the board tongue? Is this on the first floor and can you see the bottom of the subfloor from the basement below? If so you should be able to see the tips of the cleats protruding through the subfloor. Is the board tight to the subfloor? Ideally the cleat head should be flush with the surface of the tongue but if the slight protrusion is not interfering with the next row's board's groove sliding over the protruding nail head then you'll be ok. I checked the basement. They protrude about a quarter inch in the slightly up position, and a little more than quarter inch when flush. I put a board against a cleat that wasn't flush and when I tap it in, it leaves a very tiny dent in the board.. I will try to get them to go just a little more down, so it doesn't leave that dent, but not so far that it cracks.. probably that will help to get the boards tighter.. I am also having some spots where I press down with my foot at the end of the board where it meets the next one, and it squeaks. Some boards are a little bent up at the ends , so when I install I push it down and hammer it in.. but even with the nails, the board still has a very slight movement at the end and can squeak. If the boards were not bent I don't think it would do this.. This happened even when driving the nails flush with the new nailer. I'm not sure what to do or what I might be doing wrong.. It seems I need to get the wood to be really secure at the ends to prevent this movement, but the cleats aren't doing a good enough job at 3 inches, I probably should go 2.5" from the ends.. although the risk of splitting increases.. Maybe this wood is of bad quality and that could affect this? The tongue/groove seems to be too forgiving, it allows one piece to be at a higher level than the other even when they're joined, so the t&g is a bit loose.. if I run my hand along the floor it should've been all flat, but I feel level differences up and down here and there.. I checked other people's floor and I see that they're pretty flat. See my remarks in your other post re: Flooring Grade. You can get this product to work but you're going to have to spend some time picking out the acceptable pieces.